Our V8 Sleuth Aaron Noonan regularly gets asked whether any V8 Supercar drivers have ended up keeping any of the cars they have raced during their careers. It’s actually quite a rare thing – Jamie Whincup has his 2012 Bathurst winner (which we will feature next week) and Mark Skaife kept his ‘Golden Child’ Holden Racing Team two-time Bathurst winner after he retired from driving, but apart from them not too many other drivers have followed suit. 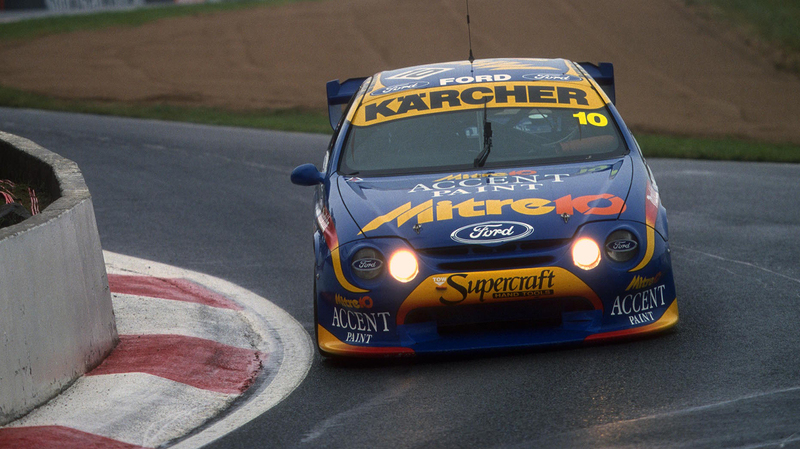 But an email from regular ‘Saturday Sleuthing’ reader David Gracie asking about the fate of Mark Larkham’s 2000 Mitre 10 Falcon has helped add another driver to that list – Larko himself! Now a major part of Network 10’s big event motorsport and RPM TV coverage, the ‘King of the Whiteboard’ has retained one of his old Mitre 10 Fords. In fact, it’s the very car built to replace the one destroyed in the nasty, fiery, start line crash with Paul Morris that occurred in 2000 at Oran Park. “We debuted it at Calder, it had been sitting there as a painted chassis,” Larkham recalls to our V8 Sleuth today. 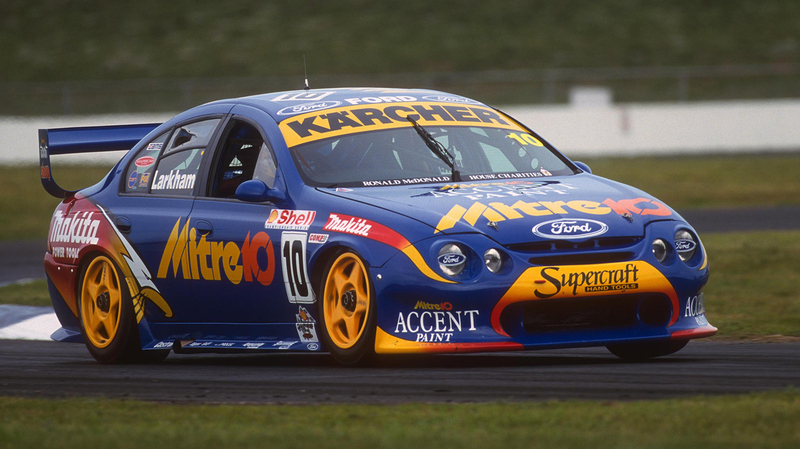 Instantly the new car delivered a result as Larkham took it to a race win at Calder Park in Melbourne in 2000. It was the result of a 17-day project that took the chassis from a painted shell to a complete race-winning V8 Supercar! The victory was Larkham’s first and only V8 Supercars Championship race win given his Gold Coast 1998 successes were not part of the actual championship. Larkham then shared the car with Geoff Brabham at the Queensland 500 and Swiss Super Touring ace Alain Menu at Bathurst. 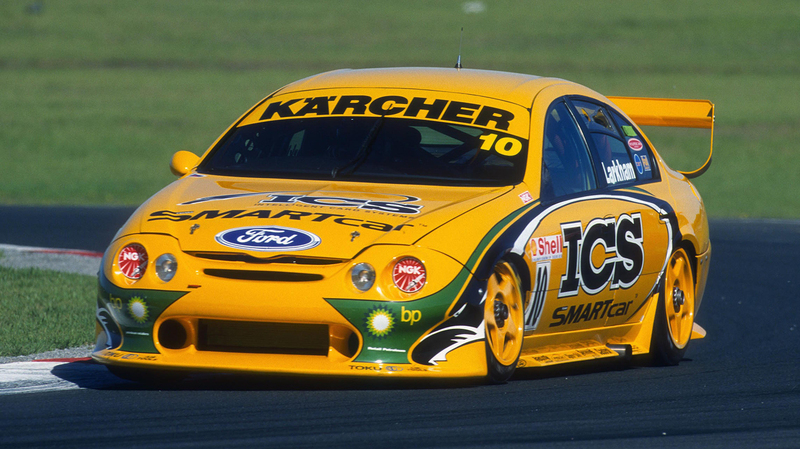 Mitre 10 finished its sponsorship with Larkham at the end of the 2000 season so the car was repainted yellow for 2001 with backing from Karcher and a new sponsor, ICS Smartcar, which sadly ended up a financial headache for the team when the funds didn’t flow as agreed. In fact, it was this very car that Larkham rolled on the warm-up lap at Barbagallo prior to Race 3 of that weekend – the right rear wheel parted company with the rest of the car! Larkham raced this car through to the end of the Queensland 500 (where he was joined by Wayne Gardner and had VIP Petfoods sponsorship) before a new car was debut at Bathurst. The Calder 2000 winner however, did race one more time in 2001 at the non-championship Gold Coast Indy event, allowing the new car to be prepared and sent by sea to the Pukekohe event in New Zealand that followed soon after. 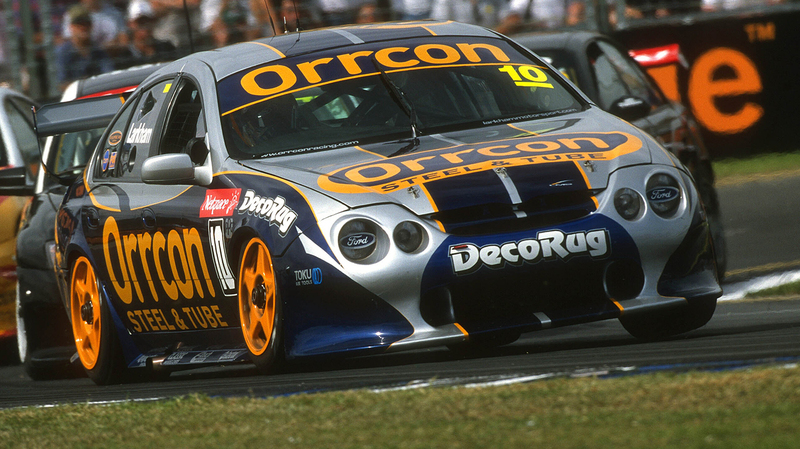 Our featured car was kept as a spare in 2002 and returned to the track in 2003 as Larkham’s #10 Orrcon-liveried Falcon, which he used through until the completion of that year’s Queensland Raceway round and he moved into the team’s newer AU Falcon. “When I sold the race team it was sitting there in Orrcon colours so one of the last things I did was to paint to back to Mitre 10 blue,” says Larkham of its post-race life. “We still had some cans of that blue paint left, so we did it properly, inside, outside and underneath. “Only a few parts had been pulled off it to go onto the BA Falcons. The foot pedals and the wiring loom were pretty much the only thing to come out. Some of the spares stayed with the team when I sold all the team off. “I sent what we had to the Gold Coast TAFE and it literally sat there so I went and collected it a few years later and up to the Warwick Motorsport TAFE program and pretty well the same thing happened. “The intentions to use the car as a project were admirable but nothing ended up happening with it so I went back up there and got it. “Now it’s in my possession sitting up on its stands and wheels that we made for it originally. I’ve got shelves full of all of the parts. “When I sold the team I made sure with that car I also kept the engine that took pole at Bathurst in 1999 too. A full-time V8 Supercar driver/team owner with his own team between 1995 and 2005, Larkham looks back on that era with happy memories. “Those Mitre 10 cars were really pretty cars,” he says. Next week will be the final Saturday Sleuthing for the 2015 season so check back to the V8 Supercars website for another important car in the history of the V8 Supercars Championship.